While staying at la Casa de Melgar I met a painter, accompanied by a group of unusual tourists. This painter takes travelers on tours throughout the world, showing them how to document their experiences through artwork: instead of snapping photos, they paint pictures. He discussed with me how you can have a richer sense of a place if you take the time to sit and paint it. You’re there for an extended period of time, and can watch the scene change as the hours pass. For example, he had just come from Cuzco where he had been painting the Plaza de Armas over several days’ sessions. Just before he finished his last sitting, a group of school children arrived, and they formed two rows as they waited for some activity. The geometry of it was such a perfect addition to the scene already in process—so he quickly sketched them into the piece before they dispersed. The experience of a place is never captured in one photo, one video, one conversation, or one story. A memory lives with depth in time, space, and levels of awareness. You don’t know what will come into frame if you take that extra time to watch and listen. There’s a lot happening right now surrounding the upcoming elections in the US. I think about the potential each candidate has to shape the world. I think about what kinds of effects each of them might facilitate at home and abroad. I also wonder what Bernie Sanders or Donald Trump were like as children. How does a child grow to affect the world in the ways that they can? I’ve become connected with two non-profit organizations that are working to fight poverty and economic disparity in Peru: Intiwawa and HOOP. The thing I really love about them is the specific approach they take to tackle the problem: they focus on providing educational resources to children. Considering the focus on wealth inequality in this election cycle, it seems appropriate think about the future we are setting up for poor kids in this world. Can Taking the Subway Give You Hearing Loss? The answer is a resounding YES. But can you really do such serious damage in just a quick commute? Again, yes. Actually, hearing loss can occur in as little as 30 minutes in the NYC subway, according to a study conducted by Columbia University. Both the United Nations World Health Organization (WHO) and the United States Environmental Protections Agency (EPA) recommend that in a 24-hour period, the average noise level a person is exposed to should not exceed 70 dB. However, the average noise levels measured across all forms of NYC public transit exceeded this value, with the MTA subway being the worst offender. The noise on subway platforms can pose a serious threat, with about half of the maximum noise levels measured hitting 90 dB or above, and the highest reaching 102.1 dB. While the noise inside of subway cars measured at slightly lower levels, the prevalence of earbuds and headphones—with music often turned up in order to be heard above the train noise—can actually put additional strain on ear drums. Given that the NYC subway sees an average 5.5 million riders per day, it seems an astounding number of us might encounter hearing loss in the future. The good news is that hearing loss from subway and bus noise can be prevented by wearing ear plugs—one of the study’s recommendations. That’s precisely the inspiration behind a campaign recently launched by Floating Piano Factory (FPF). Over the next few weeks, FPF technicians will be passing out 1000 free pairs of earplugs. 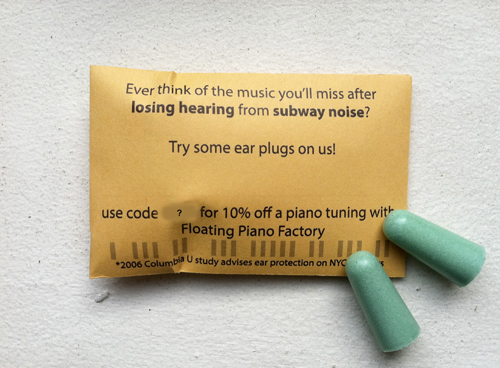 You can find Eathan, Mike, and Isaac—all piano technicians with FPF—handing out small envelopes of free earplugs throughout the NYC public transit system as they travel between piano tunings. As a bonus, the envelopes are marked with a 10% off discount code for tuning services. What do you think of this campaign? Did you receive one of the envelopes? Share your story on the FPF facebook page, or via twitter or email (floatingpiano [at] gmail [dot] com).